The meeting was stalled with 40 people standing in clusters around the edges of the room. They were stuck, frustrated, and looking for me help them out. For a day we had moved through the safer activities of the meeting, working in small groups, gathering input for the content of a purpose statement, discussing and charting the stickier points of process and structure. But this question was a high risk question. “Which of these points are you personally committed to putting some action to?” There was no hiding from that question in a small group. There was no hiding from it in the creation of more elegant bullet points. It could not be anonymously penned on a flip chart or jotted onto a sticky note right before darting out the door. This question was personal. It was confrontational. It confronted them with their own freedom to choose – am I committing to what we can create in this room, or am I opting out? Since reading Peter Block’s compelling book “the answer to how is yes,” (and having been in an even more compelling two-day workshop with him) I have rethought the way I design for safety in dialogue. “Threat can work against dialogue. If I will be ridiculed for a wrong answer, I am likely to withhold my answers until I am sure they are right. If honest opinion gets punished, I may opt for the safe, comfortable, slightly less honest dialogue that frequently fills meeting, training and conference rooms. Threat can work against dialogue. If I will be ridiculed for a wrong answer, I am likely to withhold my answers until I am sure they are right. If honest opinion gets punished, I may opt for the safe, comfortable, slightly less honest dialogue that frequently fills meeting, training and conference rooms. Safety can also work against dialogue. Exposure is the price for meaningful dialogue. And significant change — the ultimate pay off for learning — is not safe, painless or easy. It requires courage. Our design and facilitation would do well to promote courage rather than safety. Courage is ultimately more useful for the world. I have facilitated, and participated in, elegantly designed processes that made it easy to hide, to play it safe or to avoid meaning. In these gatherings, dissent has been put on the “parking lot” so that it can’t derail the process in the room. Questions and reporting techniques keep the dialogue manageable (especially for the facilitator), but they neutralize expressions of doubt, confusion, and disagreement. I still use small groups. I still sequence activities to move from easy to more difficult. I don’t call on individuals to confront them with the question I think they are dodging. But I also create space for individuals and for the group to participate in more courageous dialogue. I use questions that examine doubt, commitment and personal choice. “Head” questions can generate good information – we need them to get the ideas out there, but “gut” questions can bring a group to confront its choice. I build time into my design to process with the group how they are functioning (individually and as a group) in the meeting room. Block notes that the meeting itself is a metaphor for the organization. It is rich with data, and often partly invisible to people in the room. It is worthwhile to examine what it means if people are quietly agreeing to decisions in the meeting, then frenetically trying to lobby the CEO at break. I stay with the group when the tension builds, when they are stuck, or resisting, or polarizing, but I don’t give into the temptation to save us all by quickly designing a safer task. This last part takes the most courage from me. I am proud of my capacity to design tasks, ask the right questions, keep the group engaged in the work. I like to be the person in the room who can design the environment and the work in such a way that a group produces what it set out to produce. The trouble is, if the session is mainly a demonstration of my design capacity, it may not actually be a demonstration of the commitment of the people in the room to carry forward what they have planned. 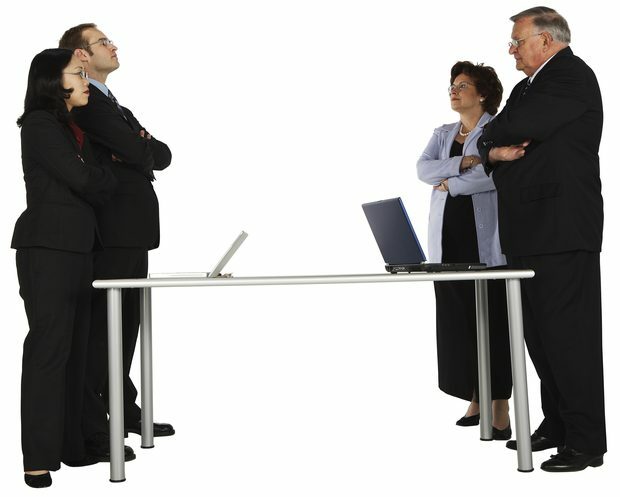 As we stood in that meeting room, the tension grew. The participants stopped talking about their own dilemma and switched to talking about how the meeting was being run. They said I was asking the wrong question. That we needed to go back and get the wording of the bullet points right first. That the categories were all wrong. In my own mind, I could already hear how the story would be told about this failed meeting. “Two wasted days! The CEO sitting in the room for two days! All those wasted airfares. And the problem is she got the design all wrong.” It was an act of will not to break the tension by moving them into small groups and giving them the task of rewording some bullet points. That would have guaranteed an output. But the bigger prize — personal commitment to the decision — would have been lost. After a torturous 20 minutes, something shifted. The group took control of the meeting. They started moving the tables around so that the room was better designed for the work. They very quickly formed groups and figured out their own process for collecting and reporting. I had designed some questions for them, but I didn’t even put the flipchart up. My questions no longer mattered. They had decided to commit, and they already knew what had to be created in the next two hours. All I needed to do was sit down, let them work and observe – with relief – the power of breakthrough dialogue at work.